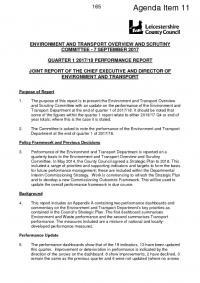 The report and associated dashboards provide an update on the performance of Leicestershire County Council's Environment & Transport Department. The report covers: waste management; the Council's environmental impact and carbon emissions; road safety; highways maintenance; strategic transport and reducing congestion; and sustainable travel. Overview Dashboards are available in Appendix 1 & 2.